I made up my mind. The new car will be a Juke. A Flame Red one. That was Scamp’s part of the decision and I quite like red cars too. Drove in to Stirling today to seal the deal and sign away all my indecision. Then Scamp suggested that since it was such a beautiful day, we should go to Perth to get tea and coffee and maybe a wee bit of lunch. Seemed like a plan, so that is what we did, with a bottle of prosecco in the boot courtesy of the dealership – you don’t get that with Arnold Clark! Perth was almost empty today. If it wasn’t for some German tourists and a wedding party, it would have been completely deserted. You could tell they were tourists because they were all wearing tartan and rotating their street map to try to find where they were. Exactly the same as we do when we’re abroad. You could tell it was a wedding party because there was a lady with a white dress carrying a bouquet of flowers. Another clue was the group of ladies with what looked like giant black spiders on their heads. Bringing up the rear were the uncomfortable looking young men in kilts, fiddling with the tight collars of their starched white shirts. Oh what fun they were all having while the photog snapped photos for the overpriced wedding album. Cynic, that’s me. Got my tea and coffee. Lunch was in the Breizh French restaurant. Food was interesting, but nothing great. A bit expensive. After reading a few reviews when we came home, it appears that it recently suffered from a change of ownership. That rarely means an improvement and that is what has happened here I think. May go back, but won’t rush. Drove home and enjoyed an almost traffic free journey. I think we were just late enough to avoid the rush hour at the merging of the M80 and the M876. It’s usually a nightmare around 4pm and we were reaching it around 5pm. Tried out the dash cam. Wasn’t too impressed with the quality of the recording until I tried it on my PC laptop with an i5 processor and everything improved greatly. It appears the Intel Core 2 Duo in the Mac just isn’t up to the job. Having said that, it will have to do the job generally for a year or so yet after today’s Flame Red investment! 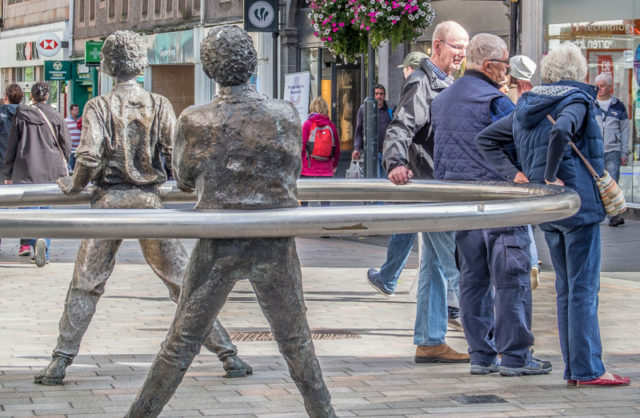 Today’s PoD is of three folk attempting to emulate the statues in Perth High Street. Life Imitates Art. Don’t have any plans for tomorrow. Just counting down the days to J-Day!